Orson Welles’s personal copy of an early script for “Citizen Kane” will be offered for auction at Sotheby’s in London on March 6. Detention sheets describing Beatle John Lennon's schoolboy misdemeanours are being put up for sale. (Reuters) - Documents linked to Oskar Schindler, the German industrialist known for his efforts to save Jews from World War Two concentration camps, were sold at auction for more than $122,000, a New Hampshire auction house said on Thursday. (Reuters) - Original manuscripts and drawings by former Beatle John Lennon, produced for two acclaimed books he wrote in the mid-1960s, sold for $2.9 million on Wednesday, more than double the pre-sale estimate, Sotheby's auction house said. 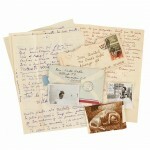 Handwritten lyrics to Bruce Springsteen’s 1975 hit “Born to Run” sold today at Sotheby’s in New York for $197,000. George Washington's Thanksgiving proclamation to sell for $12m? George Washington's original proclamation establishing the first federal Thanksgiving Day is set to break records at Christie's on November 14.